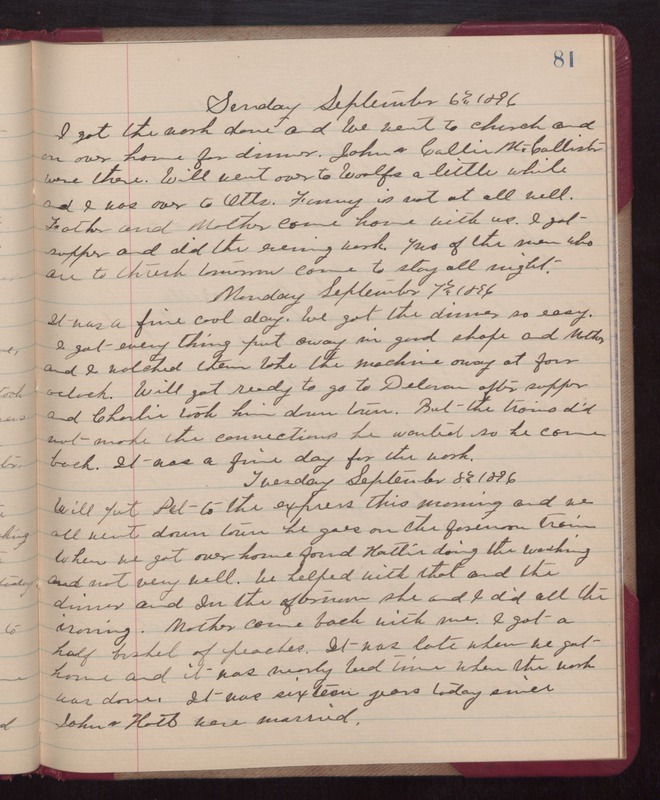 Sunday September 6th 1896 I got the work done and we went to church and on over home for dinner. John & Callie McCallister were there. Will went over to Woolfs a little while ad I was over to Otts. Fanny is not at all well. Father and Mother came home with us. I got supper and did the evening work. Two of the men who are to thresh tomorrow come to stay all night. Monday September 7th 1896 It was a fine cool day. We got the dinner so east. I got every thing put away in good shape and Mother and I watched them take the machine away at four oclock. Will got ready to go to Delavan after supper and Charlie took him down town. But the trains did not make the connections he wanted so he came back. It was a fine day for the work. Tuesday September 8th 1896 Will put "Pet" to the express this morning and we all went down town. he goes on the forenoon train. When we got over home found Hattie doing the washing and not very well. We helped with that and the dinner and In the afternoon she and I did all the ironing. Mother came back with me. I got a half bushel of peaches. It was late when we got home and it was nearly bed-time when the work was done. It was sixteen years today since John & Hatt were married.